Get ready because here’s your chance to take part in NASA’s ‘Journey to Mars’ and the first flight of the new Orion spacecraft that will ultimately transport human being to the Mars. 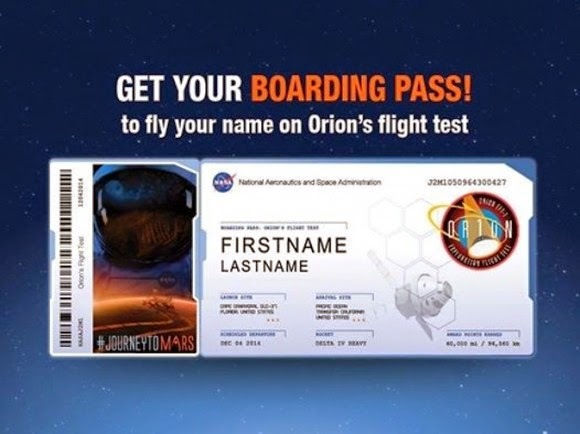 NASA offers you to send your label or name to Mars. And the journey starts via the first Orion examination flight named Exploration Flight Test-1 (EFT-1) organized for take-off on December 4, 2014 from Cape Canaveral, Florida. Today NASA publicized that the public can send their names for addition on a dime-sized microchip that will travel on spacecraft journeying to destinations outside low-Earth orbit, as well as Mars. So join over 170,000 others peoples who have by this time have signed up in just the first few hours!